I wrote the K8055 broadcaster to demonstrate how multiple K8055 cards across a network can be controlled at the same time. Each card will have the same output states (clone). I used a certain technique called 'broadcasting'. During a broadcast a single packet is sent to all individual computers on a network. This is relatively easy to achieve: you only need to send an UDP packet to the broadcasting address of your network. You probably know all network data is sent as packets. A large file is split into multiple smaller packets. These packets will be transmitted one by one. Clearly the packets contain the actual data. Besides that they also contain a header with additional information about the packet: where does it come from? Where is it going to? My application uses UDP (User Datagram Protocol) for the network communications. When you send an UDP packet to the broadcasting address (like 255.255.255.255) it will be received by all computers on your network. The broadcasting address: try to use 255.255.255.255. The UDP receiver port number (1-65535). The key to encrypt/decrypt the packets (8 characters: letters or numbers). This program is the master: enable it to specify if this software should act as the master. 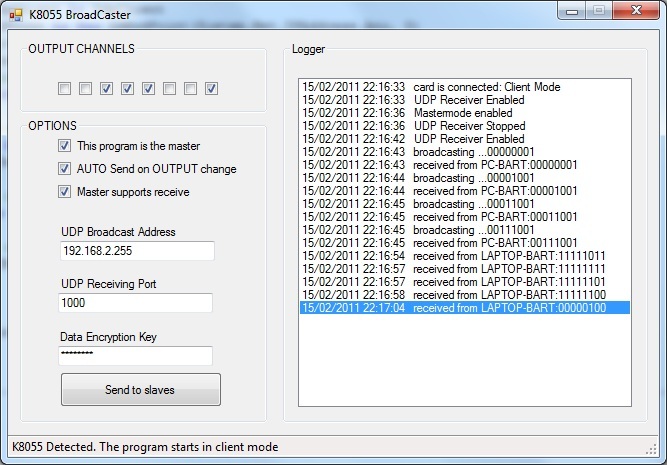 It can send broadcasts to your network: first select the desired output channels and then click 'Send To Slaves'. AUTO send on OUTPUT change: this option can only be set when the program is in master mode. Changing a checkbox will now immediately result in a broadcast transmission. You don't have to click the 'Send To Slave' buttons. Master supports Receive: select this option if you want to allow the master program to receive its own broadcasts. It is useful for debugging & testing purposes. Both source and executable are available for this project. The program is fully functional but some bugs still might exist. This was my first VB.NET project that uses network communications.